suggest new interpretations of known facts that can alter one's perception of the world around them. You can find good resources at Monash University's website. A literature review sets the context of what is already known, thought, and written, about your area of interest. This is the context within which your problem or question is identified. Your literature review shows how your thesis relates to what other scholars have said and done in your area ('area' = topic &/or theory). What should I do, because other scholars have? What should I do, because other scholars haven't? Intellectual: establishes what kind of contribution your thesis will make to the area of study. Structural: takes you from 'what I wanted to find out' through 'why I wanted to find this out' to 'why I chose this way of finding it out', forming a bridge into your method chapter in a traditionally structured thesis. Social: identifies who else is writing in your area and in what capacity. Organisational: organise your text by theme, not by reference. Try to cluster your references – for example, you may find several people who share a theoretical framework which led them to focus on related topics, using a common method. You may find others who have chosen a different approach. Your review might proceed theoretically, through schools of thought; chronologically, through a development of an approach; or use a combination of these approaches. QUT offers a useful guide to writing a literature review. Meet with your supervisor on a regular basis. 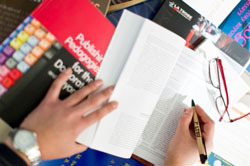 The Library offers a range of skill development and information seminars for postgraduate students and researchers. The RED unit's aim is 'to provide information, support and skills development to Higher Degrees Research scholars, supervisors, early career researchers and future research leaders'. Research Services provides an online course for new students to develop academic skills and manage their progress. Start a writing circle to develop your research writing skills. Find out more about the other student support services at La Trobe. The thesis whisperer: A blog dedicated to informing research students. The Academic Phrasebank: from Manchester University, this great language resource provides terms to make your thesis sound appropriately academic.